Heya! Could you guys be a bit more specific with the time of the deadline? It’d be helpful to include a time zone for when the edit is due because people around the US are going to enter. Alrighty, cheers! I was just wondering if good editing would give you a plus in quality. And do you have to use the same Kendamas for the whole edit? Yes, we take the quality of editing and filming into consideration. However, since not everybody has access to that kind of equipment, it will not be a make or break factor. It’s always clear when somebody has gone the extra mile and put in extra effort, and we definitely take notice of that! So Stoked! Heading out to film right now! the time on the video is 90 seconds or less and in the rules it is 1:30 or less?? which one is it?? @Logan. 1 minute and 30 seconds is also equal to 90 seconds. Hey, So me and my friend want to do this contest really bad, but we live in different areas, i live in seattle and he lives in spokane, is there any way we could do this contest still…? @Shea. Road Trip!!! It won’t be possible without filming simultaneously. There will be other contests in the future. If you had another idea, you could always take a crack at it just for fun, even if it’s not eligible to take the win. We will be giving out additional prizes beyond just what we’ve posted. If you have a vision, go for it!! Are we allowed to use other brands of kendamas such as sweets? When you guys say we get 1 sakura is that 1 for both the winners? Im so excited 2 enter the contest. I was recently sponsored by momma kendama so Im ready to enter another competition. @parker congrats and good luck! can u and your partner do two different tricks at the same time?? Im kind of confused if you win first place you get two sakura. Is that for bothe the people in the edit. For example say someone got first place each player in the edit got both of the new kendamas. Or is it juat you get both and you decide who gets what one. @alex – it’s up to you. be as creative as you want. part of the judging is on synchronization, so it would be a good idea to have some tricks that are synced well. We’re also judging on creativity, so if you think outside the box, we’ll be looking for that too. have fun, good luck! @Parker – The first place prize is 2 Sakuras. Our idea was that one Sakura would go to each person on the team, since it’s a doubles edit. We would send 2 pieces, and the winners could decide how they want to split it up. Hey i was wondering do we have to have string attached? When are the winners going to be posted? Shawn, we will begin judging now that all the entries are in, and get the winners posted ASAP!!! 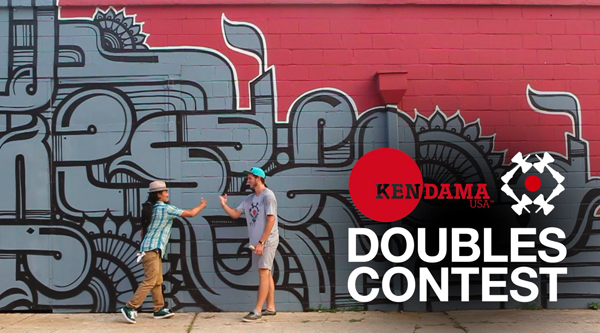 KendamaUSA, who won or placed in the doubles contest? where are you going to post the winners at? @Lukas and Mikey We will post the winners ASAP. There are a lot of entries, and most of then were sent in the last 24 hours. We will be going through the results, and posting the winners on the website here, and on our FB page once all the judging is finished this week. Thanks!! So I want to enter this contest but what if I don’t have another person to do it with? Can I do it by my self? Keep your head up and practice! You’ll be slaying Kendama in no time!